Sending messages to your group is really simple. You can either send an email to your group address (i.e. monday-book-club@gaggle.email) using your regular email client (Gmail, Hotmail, Outlook, iOS Mail etc) this will then be forwarded on to everyone in your group. 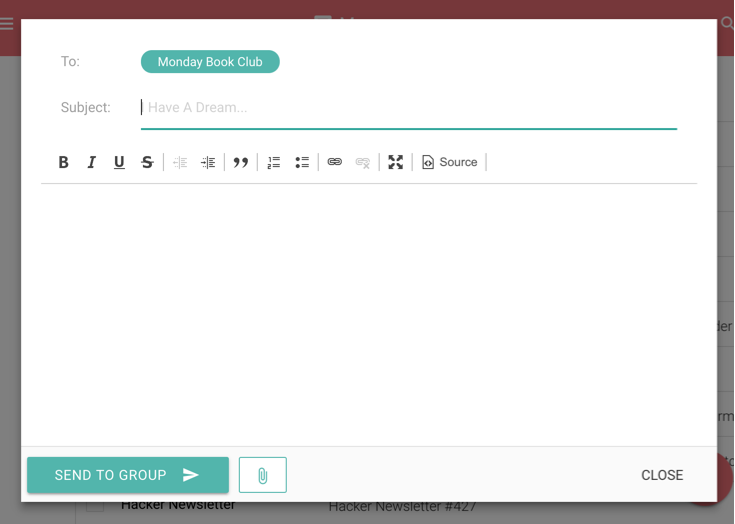 Alternatively, you can compose and send a message directly from the group administration panel. At the bottom right-hand corner there’s a circular red button which will popup the compose window. Composing a new message to your group. However you send to your group you can include attachments of up to 10MB. All messages sent via your group are stored in a fully searchable message archive which you can see in the Messages area of your group administration panel.